Millennials get a pretty hard time in the media. They have a reputation for being lazy, entitled, and drunk, and that’s just the start. Millennials are also blamed for the death of every struggling industry. A recent study by BrandWatch showed over 1,500 articles on Twitter with a headline which began “Millennials are killing ______”. According to the research, Millennials are killing lunch, beer, the cinema and restaurants single-handedly. Which is a great achievement for such a lazy bunch! If you’re a millennial you know that none of this is fair. Here at UKFast we don’t buy the stereotype either. A degree is hard work and a brave commitment to a better future. UKFast is made up of students and apprentices, so we can prove that young people are, in fact, hard-working, enthusiastic and inventive. Our employment of students is proof of the success that young people bring to a business. At just 18 years young, if UKFast were a person we’d be thinking about a degree right now too, and we wouldn’t want to have a decision about our education swayed by money. During a recent push to hire even more graduates, it became clear that student debt was the number one concern. We don’t think that’s fair. This is where GradCASH comes in. It’s our new initiative to help reduce student debt for those hard-working graduates who are ready to make the most of their new qualification. 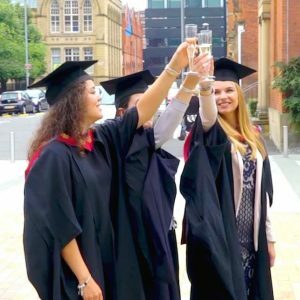 GradCASH is a scheme which gives new recruits to our graduate programme – who are hit with tripled tuition fees – the opportunity to directly pay off a portion of their student loans. The GradCASH scheme pays off £2,000 of your student debt in addition to your normal salary and the other financial benefits and perks that come with joining Team UKFast. The GradCASH fund is currently £1million, so if you do the maths, there are 500 opportunities for graduates to kickstart their career here at UKFast Campus and tackle £2,000 of that looming student debt at the same time. How do I qualify for GradCASH? If you are a recent graduate or are soon to graduate you already qualify. Just apply for a graduate opportunity here and we’ll do the rest.